Hope you've had a great weekend so far (it's still not quite over yet woo!). 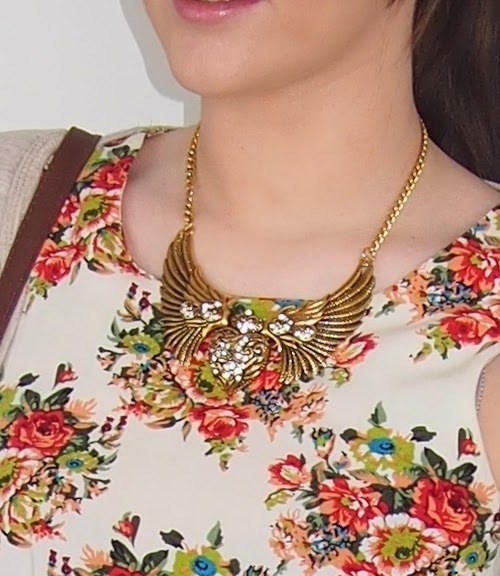 Today I thought I'd share with you 4 different ways to style a statement gold necklace. I was recently browsing on Instagram and I came across "Trinket Avenue's" page. I was loving all their statement necklaces and after liking a couple of them, they contacted me and asked if they could send me one as a gift! Obviously I was like YESSS PLEAAASE, and that's how I ended up with this little beauty! If there's ever a way to spice up a plain white shirt it's with this necklace! I think it goes perfectly with this gold skirt from Topshop, some black Newlook heels, and my favourite bag of the moment from Asos! I think it goes very well with this floral playsuit from Newlook! With a brown belt & bag from Primark, and some strappy Newlook wedges it's perfect for a spring picnic kinda day! You can also incorporate this piece into your work wardrobe! I think it looks great with a smart dress and jacket, and still shows up well over dark prints. Teamed with a quilted bag from Asos and some black heels from Newlook. It even works well in this casual look, with my favourite pair of Topshop joni jeans and a cropped Newlook top! Hurray! It's definitely going to be my "go to" necklace this spring, and I'm sooo glad they sent me it as it coincides nicely with my shopping spending ban - which has been going really well surprisingly! I've only spent £6 this week on a pastel cardigan from Primark yey! Now just £74 left for the month...wish me luck!! Thanks for reading, and you can find the link for this lovely necklace here. Good luck, gorgeous and look forward to your next post! Thanks so much for your lovely comment! Haha it's soooo hard because i've seen so many lovely things I want to buy!! But i'm still sticking to it so will see how the rest of the month goes! Love all of these outfits. First one is my favorite. And I love that necklace. I love the dinner date look! Your statement necklace is so cute! I really love the ways you've styled the necklace, my favourite outfit is with the floral playsuit. You can never go wrong with a statement necklace and the one you picked is absolutely gorgeous! Love all of the ways you styled it, it just looks perfect with everything.x I love your style, oh and good luck with your spending ban:) Have a lovely day! Heyyy my fellow greek lady!! Style for less with Miss Luxe!